As the Pinot Noir craze goes worldwide, some wine regions not traditionally known for Pinot are getting into the act, mates. Leafy and herbal, cola and "tomato-skin" notes join red fruit in a distinctly cool-climate Pinot, but fruit and balance on the palate show promise. As the Pinot Noir craze goes worldwide, even some wine regions not traditionally known for Pinot are getting into the act. Right, mates, we're talking about Down Under. While there's nothing entirely new about Pinot Noir from Australia and New Zealand - Jancis Robinson praises a Pinot made in 1976 at Tyrrell's in Australia's Hunter Valley - the great red grape of Burgundy has been slow in coming to the Antipodes. Even with significant recent increases in plantings, there's barely enough of it grown in Australia or New Zealand to register on the charts. While the Central Otago region on New Zealand's South Island is starting to earn a serious reputation for Pinot, Australia still struggles. And even after major new Pinot plantings since 2000, its total Pinot plantings barely exceed 10,000 acres, just 2 1/2 percent of the country's 400,000 acres under vine. Pinot Noir is a notoriously tricky vine, as several generations of wine makers in California and Oregon learned the hard way. Pinot grows in thousands of distinctly different clones, and its peculiarly finicky nature that yields wildly variable wines depending on climate, geology and terrain. Grow it under too-warm conditions and you get a Syrah-like fruit stew; grow it too cool, and the fruit turns to green vegetables. Pick the wrong clone, and the result may be closer to Hearty Burgundy than French Bourgogne. In short, making great Pinot may be one of the greatest challenges in the world of wine, and even good Pinot can be tough. A good share of Australia's relatively limited production goes into decidedly modest brands like Yellow Tail, in which the Pinot varietal character is, to put it gently, muted. But here and there, much as it was in California and Oregon during the 1980s and early 1990s, Australian vine growers and wine makers are working on Pinot with growing success. During a visit to Victoria's Macedon Valley in 2000, I tasted remarkable Pinots at the Cleveland winery, and a decent if somewhat vegetal and unreasonably pricey Pinot from Clarendon Hills in McLaren Vale. Western Australia's relatively cool Mount Barker and Margaret River regions are also promising for Pinot; and the screwcapped Tamar Ridge "Devil's Corner" Pinot from Tasmania is selling well in the U.S., competitive for quality and value in the middle teens price range. 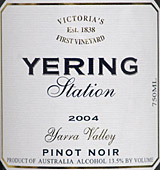 Today's featured wine, another screwcapped Pinot Noir in the under-$20 range, comes from the highly regarded Yering Station winery in the Yarra Valley, a coolish region not far east of Melbourne that's also being hailed for its Pinot potential. It's no Burgundy, and it's definitely on the vegetal side in the aroma department, redolent of "cola" and "tomato skin" and the other cool-weather Pinot scents that can be interesting in small rations but offputting in large ones. There's red-cherry fruit, too, and just a dash of oak; and the flavor shows real promise with its red fruit, snappy acidity and structure. This one's worth watching. FOOD MATCH: Keeping things simple to present the wine against a complementary background, I served it with medium-rare pan-seared grass-fed local rib eye, a fine match. VALUE: To be blunt, it's hard for it to compete against generic Bourgogne or comparable priced West Coast U.S. Pinot at this upper teens price. U.S. prices range from just over $10 to nearly $20, though, and it's a much better buy at the lower price. WHEN TO DRINK: Pinot's an ager, and the Stelvin-type metal screwcap may enhance longevity; still, I don't see this Oz item as a long-term keeper.